9 :: Gerrards Cross Golf Club is considered one of the most attractive courses in South Buckinghamshire. 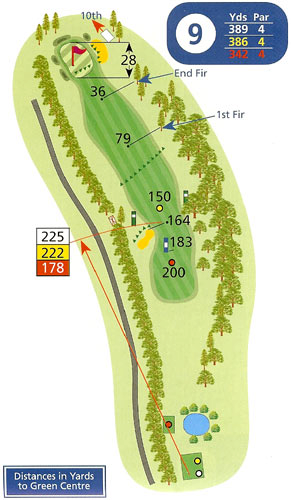 The drive is frequently straight into the prevailing wind but the pond a short distance from the tee should present no difficulty. A good strike is required to carry the long stretch of light rough and also put the green in range for the second shot. A bunker at 220 yards from the tee will collect any drives pulled slightly left. The green is bunkered on the right with swales and hillocks surrounding the rest of the green.